Timothy Griffin, Ph.D., a researcher at OMRF, has applied that old adage to the study of osteoarthritis. His lab’s recent discovery has shown how healthy types of joint-loading, as occurs with walking or jogging, are beneficial to cartilage and help protect it from breaking down over time. Osteoarthritis, or OA, is the most common form of disability in the U.S., affecting nearly 31 million Americans. It occurs when the cartilage that cushions bones in the joints breaks down and wears away, causing inflammation and pain as the bones rub against one another. OA is most commonly found in the knees, hips, fingers, lower back and neck. For this study, Griffin specifically looked at articular cartilage–the smooth, white tissue that covers the ends of bones where they come together to form joints–to study how it reacted at a cellular level to various forms of joint-loading. Griffin found that healthy forms of loading generates molecules generally considered toxic to cells, which has a beneficial effect of increasing protective responses in cartilage. While oxidation is generally thought to be bad, some is actually beneficial, because it sparks the body’s natural antioxidant defenses. They found that a key antioxidant molecule called glutathione increased in one of the loading conditions, the one similar to walking. This molecule, said Griffin, is present at fairly high levels in cells throughout the body. Our cells contain many different kinds of molecules and enzymes that protect us against oxidative stress. One of the key findings, said Griffin, is that now they better understand how exercise helps to keep our joints healthy. “This tells us that we need to think more about the pathways that regulate the production of glutathione to see how they could be harmed with obesity, aging, and other conditions that increase the risk of osteoarthritis,” he said, adding that this information could also be useful in the future for thinking about potential metabolic supplements or genetic engineering strategies that could help prevent joint damage. The data was published in the Journal of Orthopaedic Research. 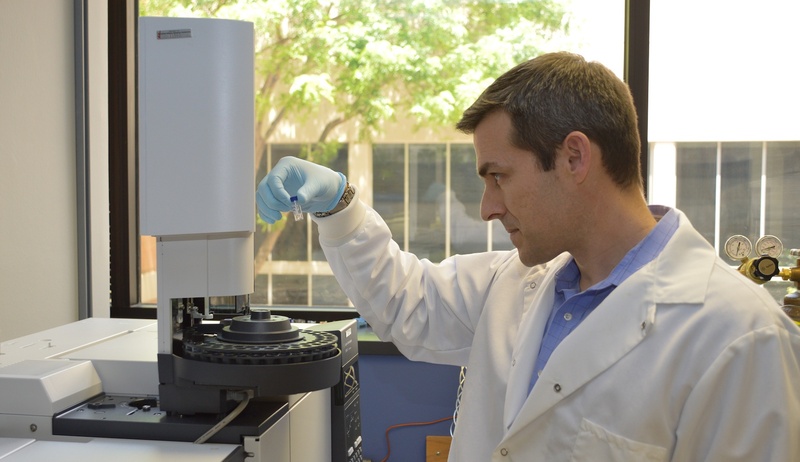 OMRF scientist Mike Kinter, Ph.D., also contributed to the findings. This research was funded by grants from the National Institutes of Health, Arthritis National Research Foundation, Arthritis Foundation and the Oklahoma Center for the Advancement of Science and Technology.